The market seems to have established a trading range of about 3%. the SnP 500 keeps making new highs (barely) while the Dow 30 keeps failing to make new highs by around 1 1/2 %. I see no reason for this to change and if it repeats the week should be down around 2% into the end of March. 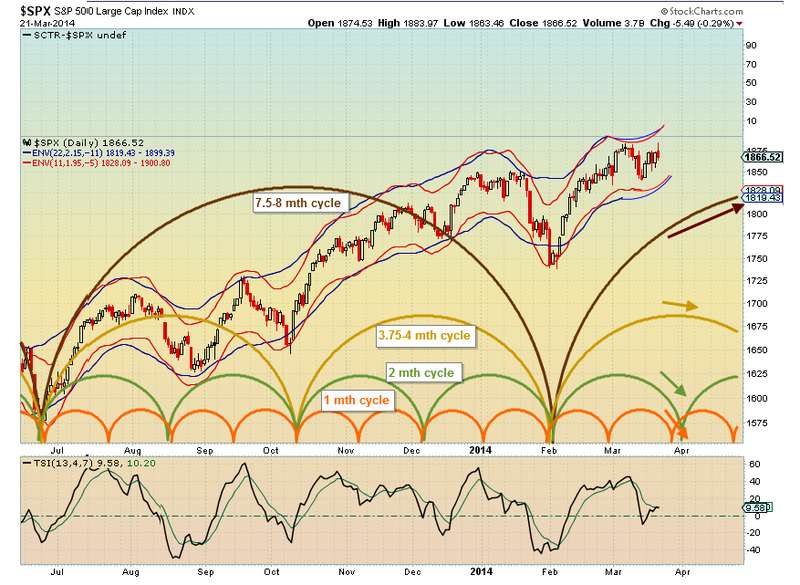 We have short cycles which should bottom this week establishing a mid-cycle dip. sp'1840/30...but that should indeed hold in the coming week. 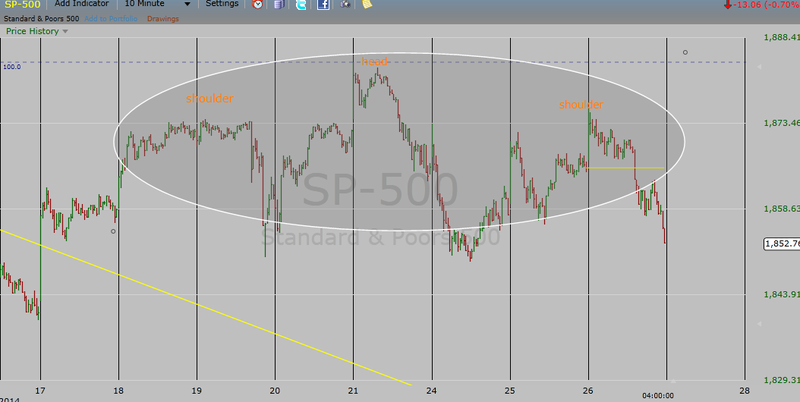 If fail..then 1790 or so....and then up across early April. Looks just about okay for the bulls into early May. Bradley dates seem to be on target over the past few months and indicate a strong market through July then a major correction through end of Nov. Can you find any cycles that can confirm this forecast? JJ - several longer cycles should bottom in the Oct-Nov time frame (see posts on Kress cycles).... If those cycles play out on time then we could have a MAJOR pullback in the second half of the year... Of course, I focus mainly on the shorter "swing" tradable cycles. As Perma notes often R2K often leads. For a long while they have out performed to the upside. Recently they out performed to the downside... watch this as an indicator of trend reversal. Spiker - The Detrended Price Oscillator (DPO) is an indicator designed to remove trend from price and make it easier to identify cycles. Use 1/2 the cycle plus 1 to isolate on the cycle being examined. For example use 51 would be used to find the amplitude of the 100 day cycle. The 100 day DPO amplitude will account for all cycles shorter than 100 days. Assuming 50 days up and 50 days down we could approximate the daily impact of the 100 day cycle by dividing the DPO amplitude by 50.... We could do this for all shorter cycles and sum (add or subtract depending on whether the cycle is up or down) to determine the contribution of each cycle. I generally just use the total amplitude of the DPO for the period I am looking at to estimate the total future impact since the longer cycle DPO includes the shorter cycle DPO impact. Am I interpreting you correctly that the DPO amplitude (ignoring the details for the moment) could be used to measure the relative strength of each cycle? Do you prefer the simplicity and time saving of equally weighted cycles, or did you experiment with identifying active cycles and find it not useful? Thanks for your time and regular analysis. Spiker - that is the theory. It uses a time shifted moving average and the variance from the average is the cycle(s) impact. This allows you to estimate the amplitude using different length MAs. There are software packages that do a lot of what you are interested in and asking about, but they can be somewhat expensive. So I try and produce a look at cycles minus the expense without spending a tremendous amount of time (KISS - Keep It Simple Stupid is my motto LOL). My work should be only one input to your analysis.